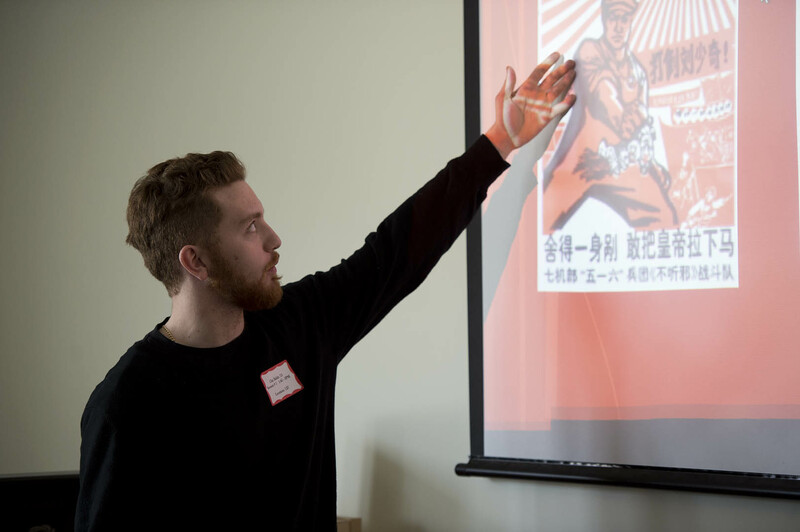 Clay Baldo ’13 explains a Chinese political poster during the Mount David Summit. Photograph by Michael Bradley/Bates College College. It’s common knowledge here in the U.S. that the Chinese government’s involvement in arts and entertainment is, shall we say, much more hands-on than Americans are used to. Presented during the Mount David Summit by their adviser, Assistant Professor of Chinese Xing Fan, three seniors described thesis projects that illustrated intriguing examples of such state involvement. Moving from Mao’s rise to dominance through the Cultural Revolution and beyond, Baldo’s poster gallery segued from scenarios of sanctioned worker violence against class enemies to pictures of harmonious collaboration in attractive landscapes. (Writers in attendance at the presentation were especially gratified by depictions of the pen as a weapon just as efficacious as a spear or shovel.) He noted that while the Chinese government still uses something like propaganda posters, nowadays they are more likely to caution against littering. Eleanor Anaclerio of Winnetka, Ill., a double major in art and Chinese, talked about the high-profile dissident artist Ai Weiwei. Anaclerio’s own artwork seemed to have some oblique bearing on her presentation: She is also a photographer whose camera obscura images explore notions of public and private space as they seem to bring Bates campus scenes into student bedrooms. What impressed her particularly about this intrepid conceptual artist, she said, is his ability to create a community around him wherever he is, whether it was New York in the go-go 1980s or on the Internet today — where Ai Weiwei has pitched his big tent because the Chinese authorities won’t let him leave the country. Maura Maloney of Ellicott City, Md., chose the toughest row to hoe, subjecting herself to hours of dating shows from Chinese television, sans subtitles, to learn about female roles in Chinese society. Maloney studied episodes of the reality shows If You Are the One and Take Me Out, both based on a British show. The shows are elaborate affairs in which male contestants use videos to make their case to a platoon of women, who can accept or reject the prospects by showing indicator lights. The shows, she said, “reflect the collective anxieties of Chinese singles” — a fraught arena in particular for women, who under Mao Zedong gained a kind of nominal gender equality that, Maloney explained, was more about making political points than advancing women’s real interests. Bates economics professor Maggie Maurer-Fazio, a China specialist, asked Maloney about state censorship on the shows, in view of another Chinese program that drew official ire because viewer voting, à la American Idol, was deemed too participatory. Censorship exists, Maloney replied, but is less political than moral, responding to women portraying themselves as sexual beings and expressing untoward interest in money. Agency, Maloney found, is the key to contentment. The women she observed didn’t want to have traditional qualities of character like gentleness and domesticity imposed on them — but were willing to assume those qualities if it was their choice. “I hear the same thing from my students,” said a member of the audience, a professor of women’s studies from Clark University.